To Cite: Irandoust K, Taheri M. The Effect of Vitamin D supplement and Indoor Vs Outdoor Physical Activity on Depression of Obese Depressed Women, Asian J Sports Med. 2017 ; 8(3):e13311. doi: 10.5812/asjsm.13311. Objective: Since the rate of depression and Vitamin D deficiency has been reported in Iranian obese women, it needs to be considered seriously by researchers. Therefore, the aim of this research was to investigate the effect of vitamin D supplement (VD) and indoor physical activity (IPA) vs outdoor physical activity (OPA) on the depression of obese depressed women. Methods: This was a prospective study with 75 women (mean age: 43.5 ± 12.8 years, with body mass index (BMI) ranging from 30.0 to 35.0 kg/m2). They were randomly assigned into four experimental groups who either did indoor or outdoor physical activity with or without Vitamin D. Depressive symptoms were assessed with the Beck depression inventory. The intervention group (indoor and outdoor physical activity with vitamin D) was administered a 2,000 IU Vitamin D per day for 12 weeks. The training program included warming-up, main protocol (treadmill versus outdoor jogging) and cooling-down four times a week for 3 months. Results: The results indicated that the level of depression in OPA + VD group was improved from severe (33.26 ± 2.12) to mild (16.73 ± 1.38) suggesting 50% improvement in depression score (P = 0.001) and there was, also, a significant improvement in the depression level of IPA+VD, OPA, and IPA groups from sever to moderate level in depression scores (P = 0.001). Conclusions: Both vitamin D and exercise (especially outdoor) have positive effects on depressive symptoms of depressed obese women. As a result, promotion of an active outdoor lifestyle and having sufficient Vitamin can counteract vitamin D deficiency and the rate of depression in this vulnerable population. Todays, obesity and depression are two major public health problems. It has been reported that depression prevalence is more in obese people compared to those who are not obese up to 25 percent. On the other hand, there is a link between obesity with depression and lower levels of serum 25-hydroxyvitamin D. The prevalence of vitamin D deficiency (1), depression (2), and obesity (3) has increased rapidly in Iran during the past decade (4). Recently, the positive effect of vitamin D on the prevention and the treatment of mental health problems such as depression has been well documented (4). Divergent results have been reported concerning the relationship between Vitamin D and depression in such a manner that some cross sectional studies have found a relationship between low levels of serum 25-hydroxyvitamin D and depressive symptoms (5, 6); whereas other studies of similar design have found no such relationship (7). A study conducted in Saudi Arabia showed that deficient levels of Vitamin D were found in women which made them vulnerable to serious health problems, in spite of living in one of the sunniest countries in the world (8). Furthermore, in a study undertaken in Jordan, 83.3% of women wearing the most covering style of Islamic dresses were found to be deficient in summer time. This is rather striking when compared to the fact that only 18.2% of Jordanian men participating in the study were found to be deficient (9, 10). Based on evidence, aberration in the vitamin D-endocrine system in obese people is found (11). It was reported in a study that an increase in serum vitamin D levels after UV exposure was 57% less in obese than non-obese subjects despite similar skin content of the vitamin D precursor. A consistent relationship between increasing BMI and lower serum 25-hydroxyvitamin D (25D) concentrations has been reported in scientific texts. It is an outdated view that skin exposure to sunlight is the main source of vitamin D production (12). It is commonly believed that people feel better “when the sun is shining”. The advantageous effect of vitamin D produced by sunlight exposure on mental health has been reported in previous studies (13). In this regard, Scragg et al. reported that those people who exercised outdoors had significantly higher levels of 25(OH)D compared to those who exercised indoors (14). According to the evidences, wearing Hijab and having less exposure of the skin to sunlight does have a significant negative effect on the biological ability to synthesize vitamin D (15, 16). It was shown in a study that obesity results in larger body surface area (17) and, thus, could be expected to increase cutaneous vitamin D synthesis; while more studies reported the relationship between body fat percent and vitamin D levels with depression. Positive health effects of IPA have been observed on longevity, people’s self-reported general health, and mental health due to the reduction in air pollution and having pleasant acoustic environments. On the other hand, increasing evidence states that close contact with nature brings benefits to human health (18). Therefore, studying the effect of IPA and OPA on mental health and related issues is of interest and may help the health practitioners in a perfect manner. Given the relationship between body fat percent and vitamin D levels with depression, it is hypothesized that weight loss by Aerobic exercise can improve the rate of depression. On the other hand, it is postulated that OPA may be an adjunct treatment to relieving symptoms of depression, not only by decreasing fat mass, but also increasing the synthesis of vitamin D levels. For a person with depression, it would be valuable to know if PA in an outdoor environment produces more affective beneﬁts compared to PA in an indoor environment due to getting vitamin D from sunlight. To the best of our knowledge, there is no study comparable with the effective beneﬁts of PA in different environments with vitamin supplement for depressed obese individuals with vitamin D deficiency. This research was primarily designed to ask the first research question concerned with whether Vitamin D can improve depression. Our second research question concerned whether out-door PA elicits greater effective benefits than indoor PA. This was a prospective study. Using purposeful sampling method, 87 participants with Vitamin D deficiency and high depression levels who had been consulting with Dr. Irandoust at Weight Control Clinic monthly were recruited. A total of 12 subjects were excluded from the study because they did not meet the inclusion criteria for the intervention study or did not complete the study. Thus, we used 75 severely depressed women with Vitamin D deficiency [mean age: 43.2 ± 12.4 years, with body mass index (BMI) between 30.0 and 35.0 kg.m-2]. The subjects were randomly assigned into treatment and control groups (15 in each group). Subjects were considered eligible if they were aged between 35 and 50 years, had BMI more than 30 and percent body fat ≥ 40%, had no evident physical limitation that would prohibit the participation in doing exercise protocol, scored above 30 in Beck depression test, had levels smaller than 20 ng/dL as vitamin D deficiency, and were not consuming vitamin D, estrogens, calcium, steroids, or other drug that would eventually disturb vitamin D metabolism. Exclusion criteria included medical problems that would preclude participation in the trial (eg, significant musculoskeletal disease, atherosclerosis); hypersensitivity to vitamin D, renal function impairment, liver and metabolic disorders; current psychotherapy or use of anti-depressants; use of dietary supplements; and participation in regular exercise during the past six month 2 day/week (Figure 1). The treatment group was assigned into outdoor physical activity +vitamin D; indoor physical activity + vitamin D; outdoor physical activity; and indoor physical activity groups by using random sampling method. The study design can be seen in Table 1. This study was approved by Research Ethics Committee of the Research Department in the faculty of social sciences, Imam Khomeini International University [reference number: 2/d/14252]. Subjects were completely informed about the process of the study, possible side effects, and other considerations, and then volunteered to participate in the study. Abbreviation: IPA, indoor physical activity; OPA, outdoor physical activity; VD, vitamin D.
BMI was recorded using weight (kg) divided by height (m) squared. Percent body fats and Waist - Hip Ratio were assessed with bioelectrical impedance equipment (Inbody 720, Biospace, Seoul, South Korea). Fasting blood samples were drawn for analyses of 25-Hydroxyvitamin D (25OHD) for all groups, at the beginning of the study and after 4 months. Venous blood sampling was taken and sent for laboratory quantitative measurements of serum levels of 25 (OH) vit. D (by using LIAISON 25 -OH Vitamin D Total Assay, Diasorin Italy). Depressive symptoms were assessed with the Beck depression inventory (BDI) in depressed obese women. The BDI was completed in a self-reported, written manner. The questionnaire validity has been reported in groups with different characteristics. A coefficient alpha rating of .92 for outpatients and .93 for college student samples has been reported whose construct validity has been established, and it is able to differentiate depressed from non-depressed patients (5). The intervention group (indoor and outdoor physical activity with Vitamin D) was administered a 2 000 IU Vitamin D per day for 12 weeks. The program consisted of a warming-up phase for 5 minutes of stretching exercises, 50 minutes of main protocol (treadmill versus outdoor jogging), and a cooling-down phase for 5 minutes of stretching, four times a week for 3 months. All training sessions were done at 11:00 to 12:00 A.M. in the Fall of 2015 in Qazvin, Iran. In Outdoor condition, after a short warm-up, subjects walked outdoors. In Indoor condition, Training consisted of treadmill walking under supervision at a health club. Each participant was instructed to achieve a target heart rate of 55% - 75%, (For the first 2 weeks with 55%, during weeks 3 through 4, with 65% and 75% for the rest of the weeks). The exercise intensity for all exercise groups was monitored by means of heart rate monitoring based on the Karvonen method RPE scale and using Polar apparatus (19), and a score of 11 to 12 on the RPE scale. Polar Fitwatch heart rate monitors (Polar Electro Inc., Port Washington, NY) were used to obtain HR. Subjects were allowed to drink water during both exercise conditions. The control group did not perform any regular exercise during the 12-week period. Food behavior including Food groups, Fruits (g/day), Vegetables (g/day), and vitamins of all participants was collected by using 24-hour dietary intake questionnaire by a dietitian. Subjects were given a scale for weighing foods. They were instructed to follow consuming standard food programs using 55% carbohydrates, 25% fat, and 20% proteins and water and minerals. SPSS software (version 21) was used to analyze the data. One-way analysis of variance (ANOVA) with Tukey post hoc analysis and independent t-test were used to analyze the data. A Tukey post hoc analysis was used to identify significant differences when a significant F-ratio was obtained. No significant difference was found between food behavior including food groups, fruits (g/day), and vegetables (g/day) of all participants (P ≥ 0.05), since they were under supervision of weight control center and received Isocaloric food program due to the same BMR, percent body fat, and muscle mass before the study. We suggest that all anthropometric factors in the treatment groups have been improved significantly (P < 0.05) (Table 2 and Figure 2). 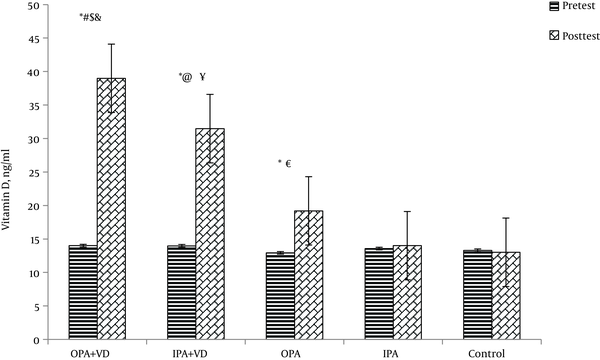 Abbreviation: IPA, indoor physical activity; IPA + VD, indoor physical activity + Vitamin D; OPA, outdoor physical activity; OPA + VD, outdoor physical activity + Vitamin D.
*Significant difference between treatment and control group, P < 0.05; #Significant difference between OPA+VD and IPA+VD, P < 0.05; $Significant difference between OPA + VD and OPA, P < 0.05; &Significant difference between OPA+VD and IPA, P < 0.05; @Significant difference between IPA+VD and OPA, P < 0.05; ¥Significant difference between IPA + VD and IPA, P < 0.05; €Significant difference between OPA and IPA, P < 0.05. As shown in Figure 2, vitamin D deficiency was found in Participants at baseline (25 (OH) Vitamin D below 20 ng/mL). In the baseline test, basal serum concentrations of vitamin D were not significantly different among the groups (P = 0.51). When the results were recalculated as the difference between pre and post treatment of vitamin D concentrations, they were still significantly different [control subjects: 13.02 ± 1.5 ng/m; OPA+VD subjects: 38.9 ± 3.6 ng/mL; IPA+VD subjects: 31.47 ± 2.8 ng/mL; OPA subjects: 19.2 ± 1.9 ng/mL; IPA subjects: 14.01 ± 1.7 ng/mL]. At the end of the study, OPA + VD and IPA + VD groups were no more deficient (respectively, 38.99 and 31.47 ng/mL; P < 0.05), and there was a significant increase in Serum 25(OH) Vitamin D levels of the subjects who did exercise in the outdoor environment (19.2 ng/mL, P < 0.05) (Figure 3). BDI, beck depression inventory; *Significant difference between treatment and control group, P < 0.05; &Significant difference between OPA + VD and IPA, P < 0.05; ¥Significant difference between IPA + VD and IPA, P < 0.05. 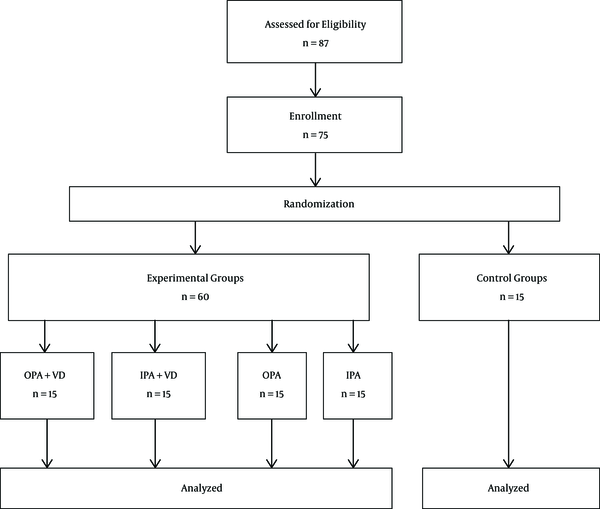 As shown in Figure 3, there was a statistically significant decreased rate of depression in OPA+VD, IPA+VD, OPA, and IPA groups than the control groups [P = 0.001]. 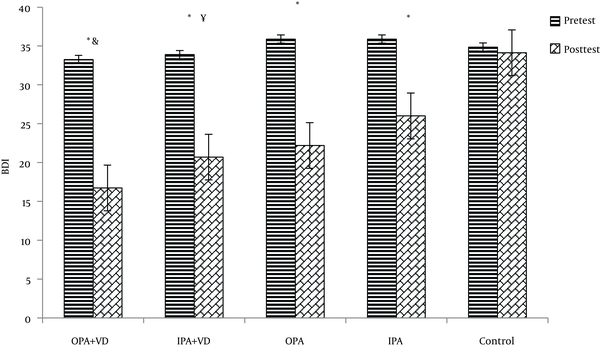 There was, also, a significant difference between OPA + VD with IPA [P = 0.004] and a Significant difference was found between IPA + VD and IPA groups [P = 0.001]. On the other hand, no significant differences was found between OPA + VD with IPA + VD and OPA [respectively, P = 0.992, P = 0.738]. As suggested, there was no significant difference between the rate of depression in IPA and OPA groups [P = 0.115]. The results indicated that the level of depression in OPA + VD group was improved from severe (33.26 ± 2.12) to mild (16.73 ± 1.38), there was also a significant difference in the depression level of IPA + VD, OPA, and IPA groups from sever (respectively, 33.9 ± 2.08; 35. 9 ± 2.11; 35.9 ± 13) to moderate (respectively, 20.7 ± 1.9; 1.4; 22.2 ± 2.1; 26 ± 1.8). The goal of this study was to evaluate the effect of Vitamin D supplement and indoor vs outdoor physical activity on the depression of obese depressed women. In fact, it was observed that those who had both Vitamin D supplements and outdoor physical activity, experienced a higher percentage of depression improvement than other groups. What is surprising is that there were no significant differences in the depression levels between OPA + VD and IPA + VD with OPA, demonstrating the key role of outdoor physical activity on depression improvement. As Lassitude is a depressive symptom, increasing OPA could mitigate some of its negative consequences. It can be concluded that physical activity and vitamin D supplement play a clinical role in the depression of depressed women. The exact mechanism by which vitamin D plays a key role in depression is not clearly understood. But, it has been suggested that Vitamin D not only stimulates the expression of nerve growth factor and promotes neurogenesis, but it also regulates gene expression of tyrosine hydroxylase, an essential enzyme involved in the synthesis of norepinephrine and dopamine which provide happiness and mental health in the depressed people (20, 21). Based on the results, vitamin D supplementation is seriously recommended for those who have deficiency. The positive effect of vitamin D intake (either oral rout or from the skin, or both) on the improvement of depression can be explained by several biological mechanisms which improve the functions of the neuroendocrine and central nervous systems (22) which may regulate neurotransmitters, neuroprotection, and stress hormones (23). Interestingly, insignificant difference in the depression level of the two exercise groups (indoor vs outdoor without Vitamin D supplement) demonstrates the positive effects of exercise in improving depression, in other words, both types of exercise environments were sufficient to reduce symptoms of depression. In this regard, antidepressant effects of exercise which improve depression by increasing brain-derived neurotrophic factor (BDNF) in women have been clearly demonstrated (21). As suggested in Table 1, percent body fat of all treatment groups were significantly decreased by exercise, which may be one possible explanation for depression improvement in both OPA and IPA groups. There are some studies reporting physical activity as an important environmental factor as an important aspect of non-pharmacological strategies not only to control obesity in addition to preventing from depression (24, 25), but also to have additional protection against vitamin D deficiency (26). Findings in earlier studies regarding vitamin D and depression have been inconsistent. Consistent with our results, some studies have reported the positive effect of vitamin D (oral route or from the skin) on depression (6, 27) whereas others have not (7, 28). These discrepancies may be explained by the differences in the study population (different age groups, races, and gender) and methodology (different methods for evaluating depression). Thus, some studies have included only elderly people (29, 30), one study only young participants (31), and another study only men (29), while we studied the middle aged women. Different methods for evaluating depression can be another possible reason for the results discrepancies. For instance, Zhao et al. used the patient health questionnaire-9 in their study, while the Beck Depression Test was used in this study. In our intervention study, we found a significant effect of OPA + VD and IPA + VD on serum 25(OH) Vitamin D levels in a manner that they had no more vitamin D deficiency and there was, also, a significant increase in serum 25(OH) vitamin D levels of the subjects who did exercise in outdoor environment. In line with our study, some experimental studies have shown the positive effects of physical activity on serum 25(OH) D (32). There was, also, one epidemiologic study (33) which reported that those who had outdoor physical activities had higher levels of vitamin D status. One reason for the same result may be related to the style of dress in both populations which leads to vitamin D deficiency. It must be noted that, outdoor physical activity itself may contribute to the maintenance of vitamin D status by increasing the rate of lipolysis which enhance its mobilization from adipose tissue, other than merely by increasing the exposure of the skin to sunlight (14, 18, 34). In contrast with our findings, Rock et al. reported that there was no signiﬁcant relationship between exercise and serum 25 (OH) D after controlling four hours of sun exposure. The reason of the results inconsistency may be related to their race in which the non-white were used in Rock Study, while we used white ones in our study. Since, it has been well demonstrated that black people absorb more ultraviolet-B (UVB) - in the melanin of their skin than white people do, therefore, they require more sun exposure to produce the same amount Vitamin D (19). As shown, exercise is equally as effective as Antidepressant medication in reducing depressive symptoms of the study patients and it can, also, be applied with Vitamin D enrichment through supplement and sun exposure. Another limitation of this research pertained to the low number of participants which limited the generalizability of the results to obese depressed women. Additional studies involving more subjects, a more controlled environment, and/or a different variety of psychological tests are required in order to make conclusive assumptions about a larger population. It must be noted that these results may be due to weight loss or other confounding factors not only exercise or supplements. So, the evidence is not yet complete enough to be crucial, and further studies are needed, preferably on people with clinical depression. As a conclusion, it was found that obese depressed women with low levels of serum 25(OH)D had improvement in depression and vitamin D deficiency if they took vitamin D supplement and did exercise (especially outdoor). As a result, Promotion of an active outdoor lifestyle and having sufficient Vitamin D can counteract with the vitamin D deficiency and the rate of depression in this population. Hereby, we thank all participants who took part in this study. This study was granted by Imam Khomeini International University.